This game is played using the pencils and the rubber bands. This is a very funny game. It is a very hilarious game and make the ambiance very jolly and funny. 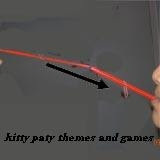 How to play "transferring the band"
HEY FREINDS I AM HERE TO TELL YOU SOME THEMES AND GAMES OF KITTY PARTIES OR ANY OTHER GET-TOGETHERS. GAMES FOR COUPLES , SINGLE PLAYERS AND TEAM GAMES.